The party’s proposals are to be submitted to the Constituency Commission which is considering how to redraw Ireland’s European constituencies ahead of next year’s elections. FINE GAEL HAS outlined four options for the redrawing of Ireland’s European constituency map, according to draft proposals obtained by TheJournal.ie. The proposals are being distributed among members of Fine Gael this week ahead of being finalised and submitted to the Constituency Commission which is tasked with redrawing Ireland’s constituency boundaries for the European Parliament. This comes as a result of the reduction in the number of Irish MEPs from 12 to 11 following the accession of Croatia to the European Union and ahead of the European elections next May. A draft of the four options being put forward by Fine Gael takes into account the need for each constituency to have between three and five seats – meaning there are only two configurations of constituencies possible: either a three-seater and two four-seaters or two three-seaters and a five-seater. “Any final decisions that are arrived at will be arrived at on that basis,” a party spokesperson said, declining to comment on the content of the proposals. The draft proposals are at odds with one put forward by the party’s North West MEP Jim Higgins whose proposal envisages a large, five-seat south-east constituency. He has insisted his proposal is aimed at ensuring Fine Gael retains its four European Parliament seats in the elections next year. “My main interest in this is come the count in the third week in May in 2014 we’ll still have our four seats,” he said. The party currently has four MEPs including Higgins, South-based Seán Kelly, East-based Mairead McGuinness and Dublin’s Gay Mitchell who is retiring. Three out of four of Fine Gael’s options advocate a 5-3-3 set-up with various configurations. Two options propose Dublin alone, with a population of over 1.27 million, as a three-seater. 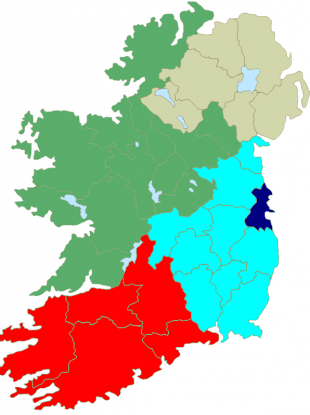 Two other options propose an expanded five-seater along the east coast including Dublin and several other counties in Leinster with the rest of the State split into two three-seaters. Fine Gael’s final submission to the Constituency Commission is expected to be submitted this Wednesday prior to the 31 August deadline. The Commission is set to issue its recommendations for the redrawing of the European constituency map towards the end of next month. As the main government party and the largest in the State, Fine Gael’s submission is likely to carry some weight. Read more: How will constituencies change now that Ireland’s losing an MEP? Email “Revealed: Fine Gael's proposals for redrawing Ireland's European constituency map ”. Feedback on “Revealed: Fine Gael's proposals for redrawing Ireland's European constituency map ”.